Great for improving connections. It's what we use! We use DeoxIT anti-oxidant compound in our shop all the time on all kinds of pinball machines- old and new. It will clean, preserve, lubricate, and improve connections in switches, plugs, connectors, light sockets, chip legs, and on all other metal surfaces. 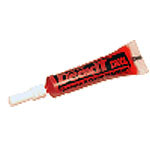 DeoxIT is excellent for use in pinball games, especially on circuit board and wiring harness connectors where oxidation and old age are common problem points. We have used this to virtually eliminate the common intermittent and problematic connections on Williams inter-board connectors (between MPU and driver board), Bally and Stern power supply and solenoid board connectors, old style Williams drop target PC boards and wiper contacts, and similar contact points to make them reliable. 2cc squeeze tube. Manufacturer recommends 1 small drop per connection. One tube will typically do several dozen connections in most games. A must for any pinball toolbox!